For the past few years, we have been struggling against the limits of battery technology in our devices. The more powerful they become, the more we want to use them, but battery capacity never caught up with our demands, so we keep finding ourselves with smartphones that mostly just barely make it through the day. To remedy this, Qualcomm introduced Quick Charge, a faster way to charge your device's battery so that you can get back to using it as soon as possible and with as little interruption as necessary. 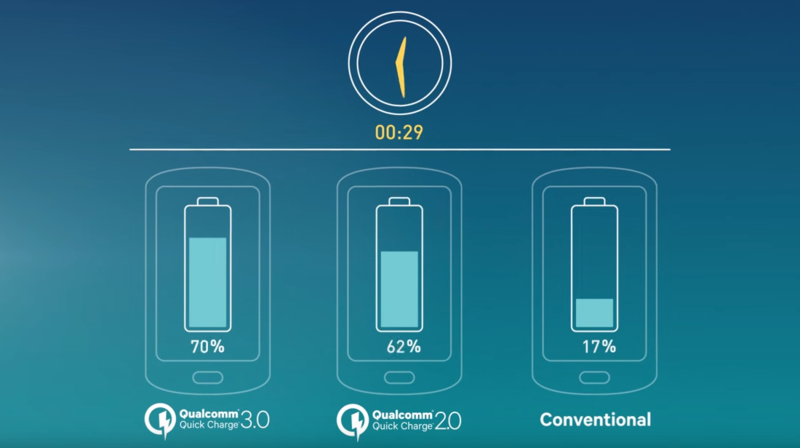 Quick Charge has been through two iterations and Qualcomm just announced version 3.0, which adopts a new algorithm to improve speed and efficiency. "Intelligent Negotiation for Optimum Voltage" (INOV) allows devices to request the optimum power input at any time to fill their batteries up. While Quick Charge 2.0 was limited to 4 specific charging voltages at 5V, 9V, 12V, and 20V, INOV lets Quick Charge 3.0 devices get exactly the power they need, in 200mV (0.2V) increments from 3.6V to 20V. This results in 27% faster charging than Quick Charge 2.0 (2x faster than the original Quick Charge 1.0) while reducing power dissipation by 45%, increasing power efficiency by 38%, and being friendlier to the battery life cycle. You're looking at 4 times faster charging compared to regular charging, and devices capable of jumping from 0% to 80% in about 35 minutes. Impressive, but I'm still waiting for full batteries in 10 minutes, that's the dream. Quick Charge 3.0 will be backward compatible with the technology's previous iterations (so your old chargers and cables should still work), and can be implemented with USB Type-C, USB Type-A, MicroUSB, and proprietary connectors. If you're anxious to get this technology in your smartphone, you'll have to wait until next year because it will be available with select Qualcomm processors: the Snapdragon 820, 620, 618, 617, and 430. Like 2.0, Quick Charge 3.0 will also be available for licensing so you can expect to find an array of accessories like car chargers, portable batteries, and wall chargers, supporting it next year. Qualcomm Incorporated (NASDAQ: QCOM) today announced that its subsidiary, Qualcomm Technologies, Inc., has introduced its next-generation of fast charging technology with Qualcomm® Quick Charge™ 3.0 technology. Quick Charge 3.0 is the third generation of this technology and is the first of its kind to employ Intelligent Negotiation for Optimum Voltage (INOV), a new algorithm developed by Qualcomm Technologies, designed to allow portable devices the ability to determine what power level to request at any point in time for optimum power transfer, while maximizing efficiency. With Quick Charge 3.0 you can charge a typical phone from zero to 80 percent in about 35 minutes compared to conventional mobile devices without Quick Charge that may typically require almost an hour and a half. Help improve fast charging up to 27% or reduces power dissipation by up to 45% when compared to Quick Charge 2.0. Available now, Quick Charge 3.0 will be featured as an option on select Qualcomm®Snapdragon™ processors, including Snapdragon 820, 620, 618, 617 and 430, and is anticipated to appear in mobile devices launched next year. Qualcomm Snapdragon processors are products of Qualcomm Technologies, Inc.
Additional improvements offered by Quick Charge 3.0 include enhanced flexibility over Quick Charge 2.0, notably in terms of charging options. While Quick Charge 2.0 offers four charging voltages at 5V, 9V, 12V and 20V, Quick Charge 3.0 provides flexibility with 200mV increments from 3.6V to 20V. This allows the phone to request just enough voltage to reach the desired charge current, resulting in minimized losses, increased efficiency, and improved thermal performance. Quick Charge 3.0 also maintains forward and backward compatibility with previous versions of Quick Charge as well as with connectors, including USB Type-C, as well as the same ultra-fast charging speed, cable independence offering OEMs several options, and UL certification to help meet quality and safety standards. Quick Charge 3.0 is implemented with minimal changes to current designs, offering OEMs a low cost option for fast battery charging. Operators and OEMs benefit from the established Quick Charge ecosystem with over 20 OEMs already supporting Quick Charge 2.0, and over 90 available accessories. The fast charging technology is mandated by several operators with active support from other operators and retailers. To date there are more than 40 mobile devices and 100 certified accessories with Quick Charge 2.0. To see the list of companies, please visit: https://www.qualcomm.com/documents/quick-charge-device-list. For more information on Quick Charge, you may also visit:https://www.qualcomm.com/products/snapdragon/quick-charge. Qualcomm Incorporated (NASDAQ: QCOM) is a world leader in 3G, 4G and next-generation wireless technologies. Qualcomm Incorporated includes Qualcomm’s licensing business, QTL, and the vast majority of its patent portfolio. Qualcomm Technologies, Inc., a wholly-owned subsidiary of Qualcomm Incorporated, operates, along with its subsidiaries, substantially all of Qualcomm’s engineering, research and development functions, and substantially all of its products and services businesses, including its semiconductor business, QCT. For more than 25 years, Qualcomm ideas and inventions have driven the evolution of digital communications, linking people everywhere more closely to information, entertainment and each other. For more information, visit Qualcomm’s website,OnQ blog, Twitter and Facebook pages.